Taxonomy: Abalone � Wild Abalone belongs to the Kingdom Animalia, Phylum Mollusca, Class Gastropoda, Family Haliotidae and Genus Haliotis. Scientific names: The scientific name of Abalone � Wild Abalone is Haliotis species. Other common names: Abalone � Wild Abalone is also commonly known as Ezo Abalone. Origin or natural range: The Haliotis species originates from the South Pacific Sea including the Korean Peninsula and Australia. Size: Abalone � Wild Abalone may grow up to an approximate size of three inches. Compatibility: The Haliotis species is non-aggressive towards the other marine aquarium invertebrates. 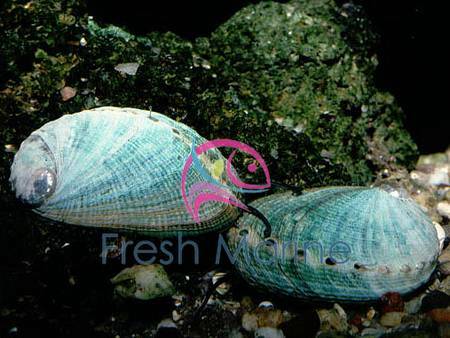 Abalone � Wild Abalone is a marine snail which is solitary in nature. Some species of Abalones � Wild Abalones inhabit cold-water and some live in tropical water regions and are therefore divided into cold water species and warm water species, respectively. Abalone � Wild Abalone is univalve mollusk, that is, it has one, ear shaped calcareous shell. A mantle surrounds the body of Abalone � Wild Abalone. The mantle secretes the calcareous shell. Abalone � Wild Abalone is unisexual. Abalone � Wild Abalone attains sexual maturity at an age of around three years. Veligers are mobile by the means of swimming fibers, called Cilia. The larvae undergo further development over the next one week till they settle down. The settled young ones of Abalone � Wild Abalone are called spat and they feed upon phytoplankton, basically micro-algae, present in substrate. After growing up to a size of around five millimeters, spat adopts nocturnal nature of adult Abalone � Wild Abalone and hides out during the day time in the crevices, coming out at night to feed. Habit & habitat: Slowly acclimate Abalone � Wild Abalone to your marine aquarium environment using the Slow Drip Method. Abalone � Wild Abalone is an algae eater and keeps your marine aquarium free of algae. The muscular foot of Abalone � Wild Abalone is globally enjoyed as food. Copper and Nitrates in any form in your marine aquarium may prove lethal for Abalone � Wild Abalone. Crabs, Rock Lobsters, Starfish, Wobbegong Sharks, Octopus, Fish, Snails and Stingrays are the predators of Abalone � Wild Abalone. Therefore, do not keep Abalone with these marine invertebrates in the same tank.